UK Radio Scanning Forum • View topic - Inrico TM-7 Mobile Network Radio. Inrico TM-7 Mobile Network Radio. 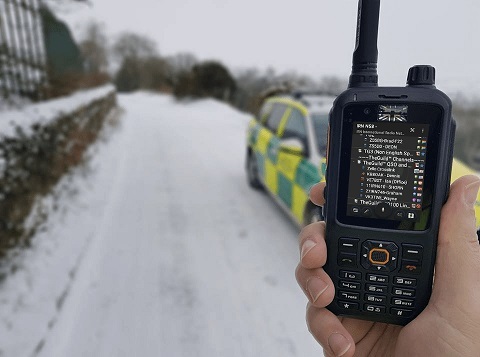 I have been looking at Network radios out of curiosity & ML&S currently have the Inrico TM-7 Mobile Network Radio on offer at £139.95, a £50 saving. Re: Inrico TM-7 Mobile Network Radio. If you get some, or even one - maybe I should try one too and see how well they work? G4RMT wrote: If you get some, or even one - maybe I should try one too and see how well they work? I like the fact it gives you the option of licenced operators only via Echolink & their app or licence free via the IRN system, but with the enthusiast on amateur radio. I have just ordered a secondhand Inrico T298s UHF. So an android network radio/phone with the added bonus of a 3 watt UHF TX. Its theTM-7, I'm actually struggling a bit. I can see that it could be a handy device to keep in touch - but surely the cost of a SIM and Data is going to be fairly expensive? The T298s look more useful if they have a real radio too? I left wondering if it's a product that is very clever, but kind of without a home? Alan - what are you going to do with yourTM-7 in the vehicle? These radios work off wi-fi & Bluetooth. So you can connect them via your phone's data or public hot spots with no need to use a SIM card. Edited to add. It is the handheld UHF Inrico T298s that I have ordered, not the mobile TM-7. As I thought a handheld would be more user friendly., than one just sat in my car. I intend to use Echolink, try out IRN & maybe APRS too. Plus being Android, I'll load a few other bits, like Air radar & Ship AIS etc. My phone is Windows, which I prefer, but having the option of Android too will be good. I may also see if I can do anything clever with digi modes, as it has a TX/RX & the potential to use apps. I have always liked Echolink. But the option to use similar non amateur systems appeals. My Inrico T295S arrived yesterday. I activated Zello & Echolink & I am currently waiting for APRS Droid to be activated. On Zello a free app, I have Network Radio, a free to use app. Network radio is simply a few channels used by radio amateurs & it's fairly busy. & listening to Network Radio is wonderful, it's everything that the repeaters should be, but are not. Good conversations & no mike keying etc. The channels are moderated & if anyone accidentally keys a mike, then a moderator lets them know. Data: Advice via Network Radio users is to use a EE data only card offering 6GB for a year (500 mb per month.) These radios use virtually no data, I am told, so 500mb per month is sufficient. The card is well under £20 for the year. It is also possible to use Zello/Network Radios via your mobile phone. The apps are even available for my Windows phone. My Inrico is also a UHF transceiver. But yes you are right it's just VOIP, just like Echolink etc. And the advantage of having a separate unit, is that you can tie your unit down to radio use only & tighten your online security up & you can QSO on the radio & use your mobile phone if you want to. I don't loose Network Radios or Echolink when my phone rings. I also spread my battery usage around, so my mobile phone battery stays healthy. Edited to add, I am not adding IRN, as I need to pay for Teamspeak & everything else is free & providing all I need.